The face is often one of the first areas to display the signs of aging. As time passes, natural aging can cause facial tissue to wrinkle, sag and lose youthful volume. While no surgical procedure can halt the aging process, board-certified plastic surgeon Dr. Victor Perez can help restore what nature has taken from you through a comprehensive offering of facial plastic surgery options. To learn more about the facial plastic surgery options offered at Renue Aesthetic Surgery, please contact us today by completing the form on this page or calling 913-685-1108 to schedule a confidential consultation with Dr. Perez. We welcome patients from Kansas City, Overland Park, Olathe and nearby communities. Facial plastic surgery procedures help to solve an array of aesthetic issues in the face, such as lost volume, sagging skin and deep wrinkles. Dr. Perez offers a comprehensive suite of face surgery options to help create a rejuvenated, balanced, natural-looking facial appearance. Facelift and neck lift: By lifting sagging skin and tightening the lax tissue beneath, this procedure softens deep folds and wrinkles, providing a younger, smoother, rejuvenated facial appearance. Eyelid surgery: Also known as blepharoplasty, eyelid surgery lifts drooping or puffy upper eyelids, tightens loose skin and removes excess fat in the lower eyelids. Nose surgery: Rhinoplasty, commonly referred to as nose surgery, can be performed to correct a specific aspect of the nose or nostrils or to improve the overall nose shape and size. Ear pinning: Often performed on younger patients, this procedure is designed to adjust the ears so they line more parallel to the sides of the head. CO2 laser resurfacing: Using advanced laser technology, laser skin resurfacing can safely and effectively treat brown spots, wrinkles, acne scars, sun damage and more. During your initial consultation, Dr. Perez will take time to fully understand your unique goals and explain all of your treatment options, including non-surgical skin rejuvenation. Together, you will design a customized treatment plan that is right for you. You will never be rushed into making a decision or pressured into undergoing any procedure. Your face is far too important to place in the hands of just anyone. You need to find a board-certified plastic surgeon who possesses the experience, skill and proven history of success necessary to entrust with one of your most significant physical attributes. Board certification: Only physicians who have met the rigorous requirements of the American Board of Plastic Surgery (ABPS) can be recognized as board-certified plastic surgeons. As a board-certified plastic surgeon, Dr. Perez has demonstrated proficiency and dedication to the art and science of plastic surgery. Experience: Exceptional skill isn’t acquired overnight; it is gained through years of training and experience. 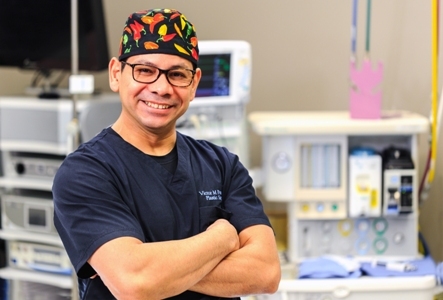 Dr. Perez has more than 25 years of surgical experience. He has gained profound understanding of facial composition and technical artistry. Results: Good plastic surgeons are proud of their work. We invite you to see the world-class quality of Dr. Perez’s work for yourself by visiting our before-and-after gallery. If you are unhappy with an aspect of your facial appearance, contact us today by calling 913-685-1108 to meet personally with board-certified plastic surgeon Dr. Victor Perez to learn more about your face surgery options. We help people across the state achieve their aesthetic goals, including those from Kansas City, Overland Park, Olathe and other Kansas communities.